Trim the bottoms of the bell peppers, without cutting a hole, so that they stand. Season the insides with salt and black pepper. Turn the peppers bottom-side up in a 9-inch x 13-inch baking dish, set the tops alongside and drizzle with EVOO. Roast for 20 minutes. Using a food processor, puree the roasted red peppers. In a large skillet, heat 2 tablespoons EVOO, two turns of the pan, over medium heat. Add the red onion, garlic, mushrooms, crushed red pepper and rosemary and cook until softened, 7 minutes. Stir in the pureed peppers and the fire-roasted tomatoes; season with salt and black pepper. Simmer for 5 minutes. Add the pasta and toss. Add the arugula and basil and cook until wilted. Turn the peppers upright; fill with pasta. Top with the cheese and broil until melted, 2 minutes. Cover with the tops and serve with any extra pasta. In Recipes-list.com we have selected the most viewed recipes from category - uncategorized . Enjoy the best recipes specially selected for you! 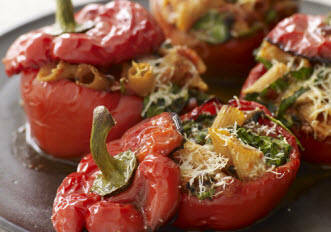 Roasted-Pepper-Pasta-Stuffed Peppers is the right choice that will satisfy all your claims.